As a seller (or in the case of books, as an author) is your marketing is working? Armed with Amazon’s “secret recipe”, you also become a better buyer. Please bear in mind that Amazon does not explicitly state how the Bestsellers Rank is calculated. The information below is based on research, deduction, and processes of elimination. What is the Amazon Bestsellers Rank? In all book categories (including Kindle paid and free books), as well as most product categories on Amazon, if you scroll down the page to the ‘Product Details’ section, you’ll see it says ‘Amazon Bestsellers Rank’. This is a number that’s purportedly calculated hourly (as stated by Amazon) and is linked to the number of recent sales of the product (while also taking into account historical sales data), relative to the other products in that category. The rank for one product can, of course, be different on different Amazon stores, as each store represents a different ‘market’ per se. For example, The Monk Who Sold His Ferrari is #17 in the Indian store, while #9,168 in Amazon.com. A rank of #1, therefore, means that product has recently sold more than any other product in that category, on that store. With this in mind, let’s take a look at what we should understand by this ranking. As mentioned above, this Bestsellers Rank is available for most products available on Amazon, but I’ll explain this topic mainly using books as a case in point. The rank is based on sales, not reviews or ratings. A common misconception about the Bestsellers Rank is that it takes into account more than simple sales, but it seems this idea is completely untrue. This rank takes into account only sales (recent and historical, more on this later), so I’m afraid getting tons of Amazon Vine members How to Become an Amazon Vine Reviewer & Get Free Stuff How to Become an Amazon Vine Reviewer & Get Free Stuff An Amazon program that's been around since 2007 might make you think twice about the power of good reviews. It's also an opportunity to get picked up for the program. Find out more here. Read More to leave you tons of reviews and ratings won’t necessarily help your Bestsellers ranking. This means that a rank is not representative of cumulative sales (or overall sales volume), but more on how a product has been selling very recently compared to others in it’s category. That being said, although reviews and ratings have no direct bearing on a Bestsellers Rank, they are likely to influence people to buy your product, and thereby indirectly help your Bestsellers rank. According to Amazon, the Bestsellers Rank is calculated hourly, but sometimes there is a lag between an increase in sales, and an improvement in a ranking. This lag is usually no more than 2 or 3 hours, but there is some debate over exactly how many product rankings are calculated hourly. This article on WebProNews, mentions that, in the books category, only the top 10,000 books are calculated hourly, whereas books with a ranking of 10,000+ are calculated once per day with ‘current projections as well as historic sales information play[ing] a key role in calculations’. Contrary to belief, paid and free books on Amazon Amazon Adds 1,000 Free eBooks to Prime Amazon Adds 1,000 Free eBooks to Prime Prime Reading offers Amazon Prime subscribers unlimited access to more than 1,000 eBooks, magazines, short stories, comic books, and more. All for free. Read More are weighted the same when it comes to the Amazon Bestsellers rank, but are treated differently (in that they have separate bestseller lists). As mentioned, all that counts is the number of sales relative to other products within the same category. Amazon splits ‘paid’ and ‘free’ books into separate categories, so these act as sub-sub categories, in turn having their own bestsellers rank, which seems to be ranked using the same (or very similar) algorithm to paid bestseller ranks. Along similar lines, if your product is selling a steady one unit per day, but some of your competitors start to sell more than you, then your rank will fall (i.e. the number will get higher), even if your sales remain steady. What this also means is that a book that’s ranked 800,000 can see it’s rankings skyrocket to 200,000 just with a couple of sales. As you move up the ladder, however, Amazon’s complex algorithm kicks in soon thereafter making it harder for you to break through the 100,000 milestone, and even harder to get past 10,000. This is because these higher rated products have historical data to back them up, so a lull in sales for them won’t result in as dramatic a drop in rankings as it would for a new product with less data to draw on. In all, the ranking seems to be somewhat logarithmic. When it comes to ranking highly on the Amazon Bestsellers lists, as the ranks are based hourly (or daily if the above information is correct), then a quick spike in sales due to a successful marketing campaign, followed by a lull in sales a couple of days later will only serve to see the product’s rankings quickly plummet. It’s far better to space out a product launch over a period of week, so Amazon can collect consistent historical data to make predictions on future sales. This will thereby make it easier for you to break into higher spots on the ranking table in future. To learn more about what it takes to get to =1 on Amazon’s Bestsllers rank, see the below video. Amazon Best Seller Rank 35 to 200 –selling500 to 2,000 books a day. 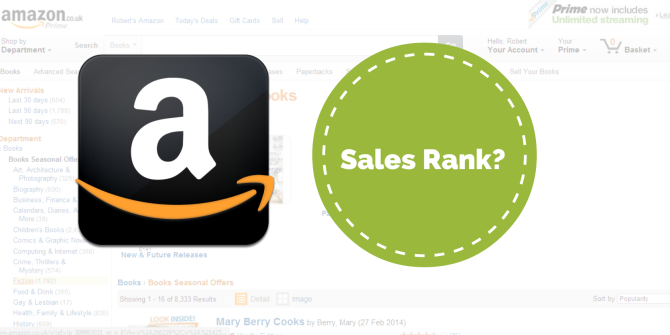 What else do you know about the Amazon Bestsellers Rank (Sales Rank) which isn’t mentioned above? I just wrote a book "The Bug Who Saved the World." It was published on August 23rd and was put on Amazon by the publisher. How can I track the sales and the rank? Google "keepa extension", Install chrome extension, go to your book sales page on Amazon and it will load up below the photos/description when it has enough data available. Hi. May I ask a question? I would like to find the best product to sell on Amazon. Therefore, I would like to see all items in a specific department. I read on a couple of websites to type  after choosing the department, but this obviously doesn't work. Do you know any alternative way to see all items in a specific department? That would be so helpful. Try typing -asddfxssxbbds. Type the minute and then a bunch of random letters. This should give you the items in the category in best seller ranking. Hope that helps! Best site to search and view BSR (best seller ranking) in any category is bsr.today - great site ! Hi is this chart shown in the bottom of the article only relevant to books or also for all Amazon products? Just for books, I'm afraid. Hi is this chart shown in the bottom of the article only the book rank chart or its relevant to all Amazon products?? good thinking but you need also seo work bro. "it’s the sales that cause the ranking. The ranking doesn’t cause the sales..."
Wait. You're saying ranking doesn't influence sales? If that were true, then why do marketers loudly proclaim their ranking in all their sales pitches? The rankings ARE a form of marketing. A "Bestseller rank" is different from a "Sales Rank". Amazon don't make it that easy to distinguish the two, but they are different. A "Bestseller rank" is far more often used as marketing. Ranking influences sales. Top a category and the sales start coming. Don't you need sales to initially start ranking though? But this is not a guarantee. Some books are really bestseller material and some are not. Lets introducing myself. I am an AMAZON SEO Expert. I have been working on product SE0 for 3 years. I will sincerely and successfully work for increasing ranking of your product. Purchase, wishlist, gift idea, review, Question Post,seller feedback,Product Review Voting etc. If you give me, I will work my best for you.. I have a book on Amazon and I decided to ask my 25 friends to buy it in Oct 26 2017. Do you think this will help my book to get " best selling " ? From what I've seen, reviews, posted on Amazon.co.uk will not appear on Amazon.com or Amazon.ca. Thanks very much for this post, the information you have provided will help me improve sales. "This rank takes into account only sales"
I just launched 15 colouring books for grown-ups at the beginning of November. With no marketing or reviews I was selling a few copies. Almost two weeks later when I was looking for something else I spotted some of my books had gone into the Bestsellers list under Adult Colouring Books and Stress Management. At one point 5 books where up in the Adult Colouring Books and 2 in Stress Management. I've still done no marketing. Then a couple dropped out of the Colouring Books but not too low that they can't come back into the Bestsellers later. I have one left in the Stress Management. The other books I have are about 170s mark so with a bit of work might get into the Bestsellers. However, the list of books sold according to ranking do not tally at all. According to the ranking scales I should be selling hundreds per day but that is not happening at all and all I have is a Bestsellers ranking with few sales. It really does not make sense as this is a hot genre. Tania, the sales numbers you are referencing are within certain categories. The numbers listed above are for the overall amazon sales rank - how you rank compared to every other book on amazon. It is much easier (and still productive) to reach a to 100 sales rank within a certain category as people do search that way. However, the category sales ranks will not reflect the sales figures listed above. People actually don't search that way. They use Amazon search, or Google search, and just very few of them search within categories. If you check average Google monthly searches for any top 10 author on Amazon, you'll find out there are hundreds of thousands searches for their name and for names of their books every month. But when I check my name, only 70 people a month look for it - that's just not enough to crack the list with the University of solitude. Very interesting article and I just shared it in an Author group because it's the best breakdown of figures I ahve seen yet. My book "Plan Your Website" has been in Pre sale for about a week. I re-uploaded it several times in the innitial stages whilst I was finding things to change and I don't know if that helped. I staggered the announcments over a few days and saw the kindle version shoot to number 1 in the first 24 hours. I'm aware that its quite easy to pick a category and become a best seller in it. I see Internet Marketers do it all the time for positioning so I wanted to get the UK topspot as a way of feeling justified in promoting myself as a Best Seller. The strage thing happened within 72 hours of announcing the pre launch. I hit the #1 spot in 5 categories, overtaking books from Celebreties in the UK such as lord sugar. I took a screenshot posted his own catchphrase "I'm Sorry Lord Sugar, Your're Fired" with me at #1 and him at #2. That say sales rocket again and shortly after I was in all the trending, new releases and also climbing the ranks on .com .au and .de which was very unecpected. I guess my learnings have been innital sales can give you the positioning that you need to attract future sales and its great to have a plan for this. Now I've promoted this organically I'm starting to settle into retargeting traffic and PPC adverts to get a consistent awareness out. I'll also be talking on stage on teh 24th October to 1000 people where I will be promoting and officially launching the paperback version so really excited to see how this affects the trend. again thanks Rob for the awesome resources here. Steve, that's amazing progress you made. I'd love to chat with you move about your experience if you're interested? I'm especially interested to know how sales are impacted as one climbs the best-seller lists on Amazon? Does it make a huge amount of difference to sales? I've just recently published on Amazon, and as I am from Ireland, most of my sales are coming from amazon.co.uk- yet for my sales rank it only seems to be counting the ones that come from amazon.com? Just wondering if you could shed some light on this for me? I'm afraid I'm not sure why this is happening, John. If you find out the answer, I'd love to know, though! I've been driven nearly to distraction that my BSR Category keeps getting placed incorrectly. The product category is correct, but instead of it showing BSR of Electronics, it shows BSR in Office Products. I've contacted seller support nearly a dozen times over this issue, and each time they are able to fix it temporarily for about 3 days before it reverts back to Office. It looks like my listing is totally just thrown together and unprofessional. I also can't see how I'm ranking in comparison to my top competitors in the Electronics category, other then seeing how many pages behind them I am at. So inconvenient. Do you have any tips on adjusting the BSR category permanently? Beach Gal, sorry to hear you're having these troubles, but I'm afraid I've no idea how this could be fixed, as I've never come across the issue before. Please let me know if you figure out a soution! Great article! My book, "The Spider and the Wasp" (http://www.amazon.com/The-Spider-Wasp-Trauma-Survivor/dp/0991438310), will get down to about 2,600,000. I sell one and it jumps to about 450,000, and then drops back down to 2,600,000 over the course of a week. Last night it jumped to 225,000... so maybe I sold two in a day? Selling books is a tough thing to do. Wanting somebody to buy my book is like asking them to pay me for ten hours of their valuable time. I'm glad I didn't go into it with any pre-conceived notions of success. Matthew, what kind of marketing did you do for the book? Do you have tips for marketing a book? Conny, I'm not sure, to be honest. Perhaps something to do with angorythm changes? Or simply your relation to others in your category, which can naturally change without your sales changing at all... so, if the sales in 50% of your category are fluctuating (which they are), this will naturally change your relative rank, even if your sales stay the same (even at 0)... In all, though, it's impossible to tell for sure. Please let me know if you find out anything else! I'm afraid not, Erik- please let me know if you find this though! It looks like Theresa Ragan's page on sales ranking went away when she updated her webpage, but is still accessible from the wayback machine. Good point, Patrick! I only really researched English speaking Amazon stores, as this is most relevant to our readers, so am not sure how this translates to non-English speaking Amazon stores... if you could point me to any data you find on this topic, it'd be most appreciated! Hi Tushit! Congratulations on the launch of your new book! In the paid category, many other books will be selling more copies than yours. In the free category that you're listed in, you'll be selling the most copies in that specific category... Basically, this is how it looks like the sales rank works. Dear Rob thanks for the excellent post. I am a new author in Kindle and have published a preschool book "MY FIRST PRETTY BOOK OF ANIMALS: a gift for little ones". My free rank was #1 but my paid rank is #280,230. Please tell me why such a difference has happened. Secondly I want to know how did you determine the figures of sales and amazon rank. Your advice will be really grateful. Just curious why some products show no ranking info at all? Thanks! From what I understand, this can sometimes be because a product is new, or that they just haven't had any recent sales, so they simply don't rank against other products in that category... hope this helps! Sales ranking do influence people to click on a product just as positive reviews do also. If a book has a 1million rank savvy shoppers know its bombing and not very popular. Its like anything else in life...hype...hype...hype. use it to your advantage. I have two books on amazon and as indicated by amazon sales record, 4 copies have been sold since July. My amazon ranking varied bet ween 400000 and 7000, I think with each sale. How? I disagree. I don't know a single customer that buys based off of BSR. Most people just type in what they want and purchase based on price, reviews, and prime availability. Thanks for this. I've had a book out since June and have been trying to crack one list or another so that my book is buried on the "shelf". The info is appreciated! Thanks, Russ! If you manage to crack one of those lists, I'd love to hear your story! The screenshot in your main article shows that Amazon treats paid and free sales differently - they are actually different bestseller lists. They used to be published side by side, with the top-selling free book in a category to the left of the top-selling paid book, but as your screenshot shows, they are now different pages. It used to be that when a bestselling book came off free it would temporarily enter at the top of the paid charts, but that hasn't been the case for over a year. Of course, it's easier to be a bestseller in a small category than across the whole of Amazon, so an author will need fewer sales than the numbers you quote if they are only competing in a small category. Hi Lola! Thanks for your comment. I'm getting this section (free vs paid) of the aricle changed, so this is made clearer- as mentioned in a previous comment, it seems the weightings are the same, but the lists are different.... Thanks for the heads up. I took a look at all of this in more detail and reaslised I needed to clarify this in the text., so hopefully those edits will be online soon! "While the algorithm deciding your Sales Rank doesn’t seem to place any weight on copies that were downloaded while your book was free, it appears that the algorithm feeding into the Popularity List does. " The actual way Amazon does calculate the Overall ranking though is a trade secret, so this is relying on reverse engineering changes seen after getting sales jumps/or doing free giveaways. And apparently there is also a dlooars per sale weighting in there, as in some cases fewer sales of a higher dollar book can push you up more than a lot of sales for a 0.99 book. Lastly, I am sure that Amazon reviews trends for this very closely and tweaks / adjusts their algorithims frequently to help guard against people gaming the system to their detriment. Hutch, thanks for your reply, and thanks for the email you sent me! I've took another look at all of this, and want to thank you for pointing this out. I'm getting that section of the article clarified now, so it's clearer that free and paid have separate besterller ranks, however the rankings seem to be calculated in the same way (or very similar). See David Gaughran's blog/books to get a super-clear explanation of all the various Amazon Top seller lists (Top 100, New Releases, Mover/shakers, etc.) and how they are scored/weighted/calculated. Guess you have to buy Hutch's AKA David's book to find out. I won't be doing that David, sorry Hutch. This is good info. My wife, Rosanna Chiofalo, has two books out under Women's fiction(Bella Fortuna and Carissima), and we are checking Amazon sales ranking weekly. Funny. We would check the rankings daily when her books are newly released, but just check them occasionally if the books have been out for a while.